1995 Tiffany & Co Italy Atlas 925 Sterling Silver Roman Numeral Cuff Bracelet 5"
For your consideration is a Vintage 1995 Tiffany & Co. Italy Atlas .925 Sterling Silver Roman Numeral Cuff Bracelet in pre-owned condition. This bracelet shows signs of wear and features Tiffany & Co.'s signature Atlas collection design with roman numerals set into a matte finish crafted in fine Italian made sterling silver. Cuff is 7.7mm wide. Inner circumference of the cuff measures 5 inches. Weighs 21.5 grams. Please view our photos for additional information. 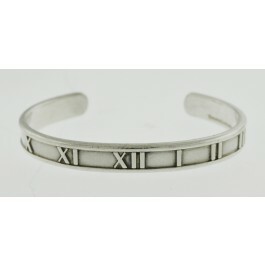 You're reviewing: 1995 Tiffany & Co Italy Atlas 925 Sterling Silver Roman Numeral Cuff Bracelet 5"